“Follow the girl in the stolen shoes. The entire poem celebrates the road less traveled, but infuses a mystical feminine air into the concept to birth it anew. From here G’Sell leads us to the poem “Women and Children,” then breathlessly into “The Reason the Moon Moves.” These poems seem to reference one another, leading back to each other in a sacred circle. In these verses, the wonder and mischief (“The world is full of women and children. They are lifting, spitting. … They are dirtier than you remember—holier, too.”) of women and children are able to keep cosmic bodies in orbit, or to melt the equator of Earth. This is a vision of power without violence or coercion: “On quiet horses, women and children are storming the city today.” For women and children, their very existence is their power. Their joy is their strength. 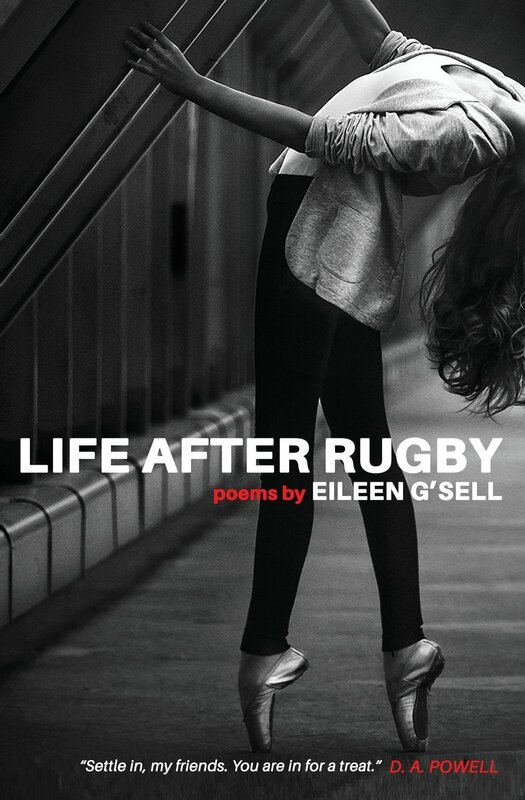 In the world of “Life After Rugby,” it is possible to find ecstasy even in the difficult bits of life. “Camus Comes Out of a Coma,” posits that if heaven exists it’s a place where all beings get to be adorable. “The pitbull, the vulture, the substandard tip: they too will be adorable,” the poem promises. The repetition of the word puts in mind religious ritual, and the ancient connotation of adoration of an icon overpowers the contemporary How cute! usage. I got mean veins, but a kind heart. The kind keep trying to talk to me. Indeed, all elements of life are roundly approached with curiosity here. “All Epics Are Disappointing and All Disappointments Are Epic” begins: “Sometimes I like to have feelings because they are so impractical. They are electric-green Mary Janes on a hike and they are my favorite color.” And so, even the difficult and inconvenient facets of life are honored in G’Sell’s work. The titular poem, presented in seven parts and varying forms, may require several readings. Read one way, the poem is delivered from the standpoint of Life herself, wandering and banging into dead ends or dark corners occasionally. But Life dances on, vigorously, and G’Sell follows her back home to radical joy. Laura Eppinger is a Pushcart-nominated writer of fiction, poetry, and essay. Her work has appeared at the Rumpus, the Toast, and elsewhere. She’s the blog editor at Newfound Journal.